Chat live with visitors to your site with Drupal live chat module. Provide better customer service with our live chat and help desk integration for your Drupal website. Increase your conversion rates and provide a brighter interaction for your visitors while they are browsing in real-time. How to install Paldesk on a Drupal website? Step 1: If you don’t have a Paldesk account already, click here to create one now. Step 2: Log into your Drupal account. 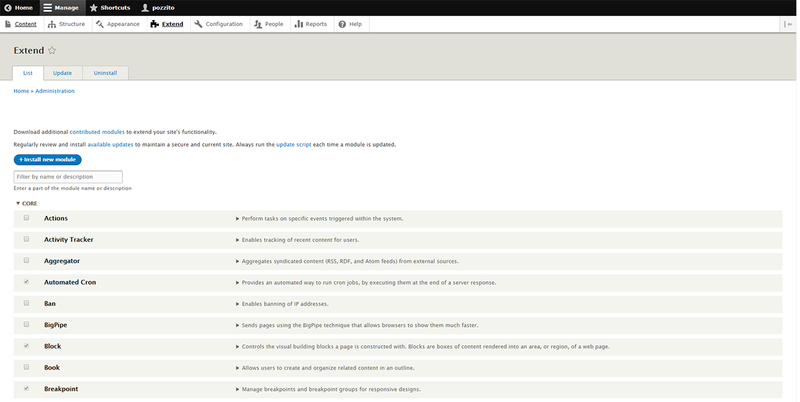 Step 3: In Drupal, click on the ‘Manage’ tab and then click ‘Extend’. In the Extend section click on ‘Install new module’, choose Paldesk .zip file and install the module. Step 4: After the installation is complete go to the ‘Next Steps’ section and click on ‘Enable newly added modules’. Step 5: In the Search field enter ‘Paldesk’. Mark your module and click on ‘Install’. Step 6: Under the ‘Manage’ tab, choose ‘Configuration’ and find the ‘Web Services’ block. There should be a module named ‘Paldesk Live Chat’. Click on it. Step 7: To fill API key field, go back to your Paldesk dashboard, choose ‘Administration’. Under ‘Embeddable elements’ select ‘Website Widget’. Click on ‘Install’ and copy the API key at the bottom of the page. Step 9: Paldesk – Live Chat & Helpdesk module will display on your Drupal website.